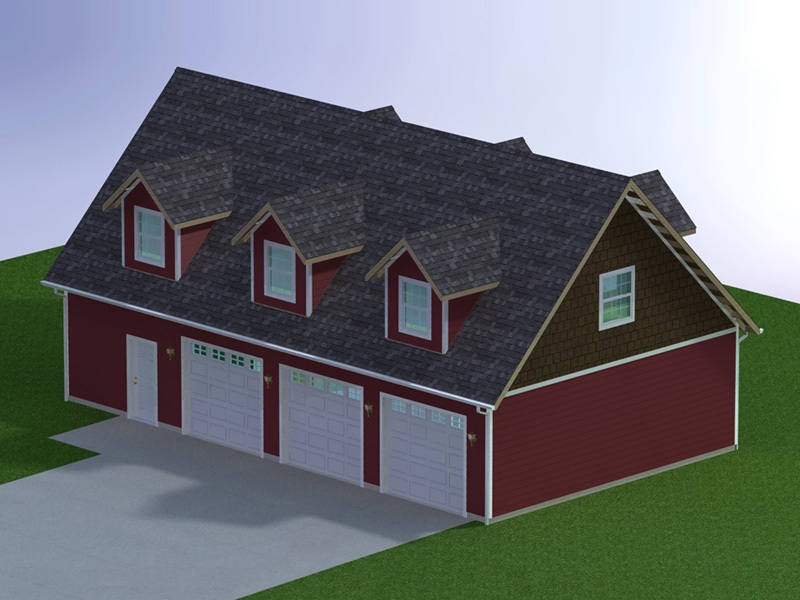 On my previous design I did flat outlookers on both gable and dormers. This time I left the dormers the same and then dropped the gable end for outlookers. I figured the overhang on the dormers is a bit less so I could probably get away with flat outlookers also the length of the rakeboard on the dormers is only about 6' long so it should be fairly well supported. 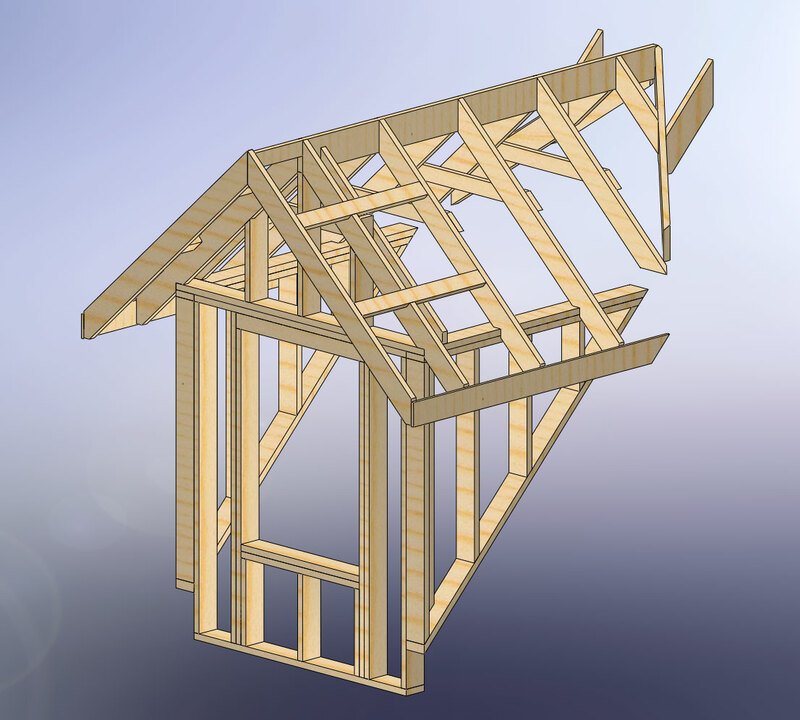 In my framing model I don't show any of the truss bracing that needs to happen between the main trusses and the piggyback trusses. I've also omitted some the extra blocking that might be required for the sheetrocking, but most of it is there. I'm assuming that with the overhangs one would simply frame solid blocking between the outlookers so that there are no "bird" holes. With regards to the apartment up top. I have a door with auto-closer at the base of the stairs, does this meet code? 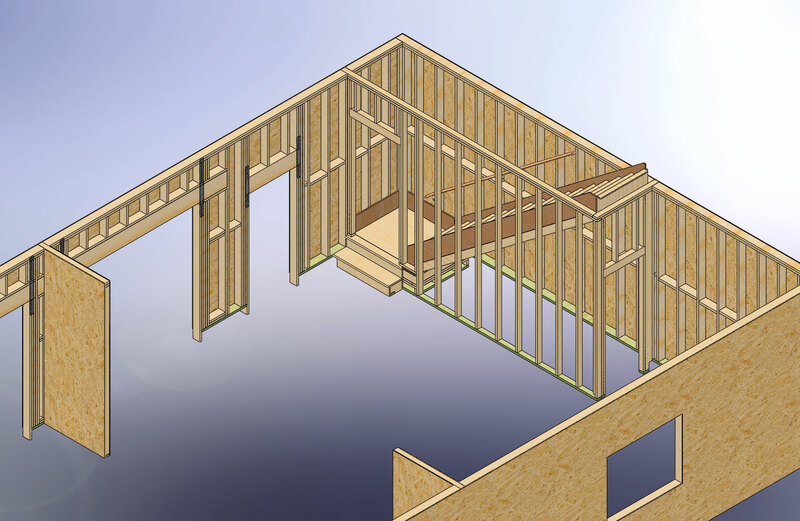 The framing for the walls around the stairwell is on 16" centers as it should be. I'm not exactly sure what to do with the bit of framing next to the wall where the base of the studs run into the concrete stemwall, maybe someone can enlighten me what is common practice in that case. 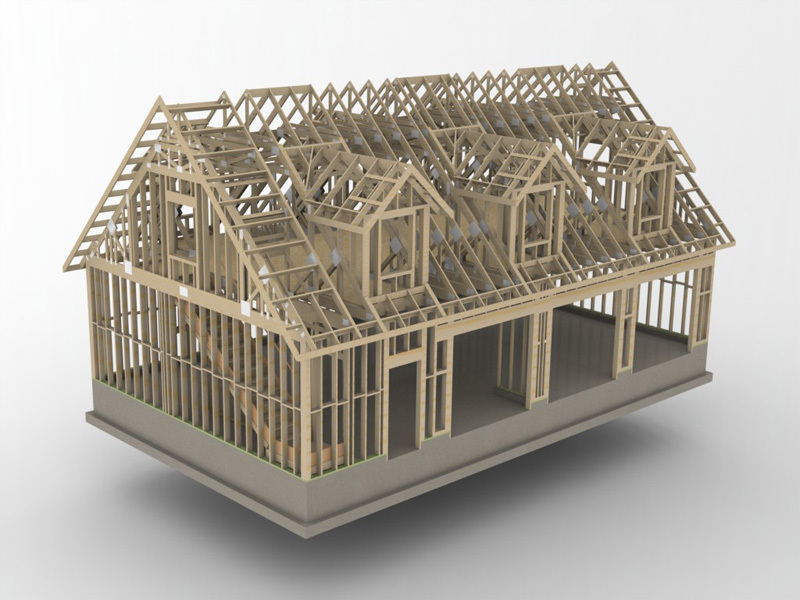 I'm really starting to like the idea of a deck off of the gable end, simplifies the interior framing, roof framing and eliminates all of those pesky fire code issues. If there is a space upstairs used as an office/studio (possibly with 1/2 bathroom) etc... but not a living space or apartment (no bedrooms) then what I have is ok? 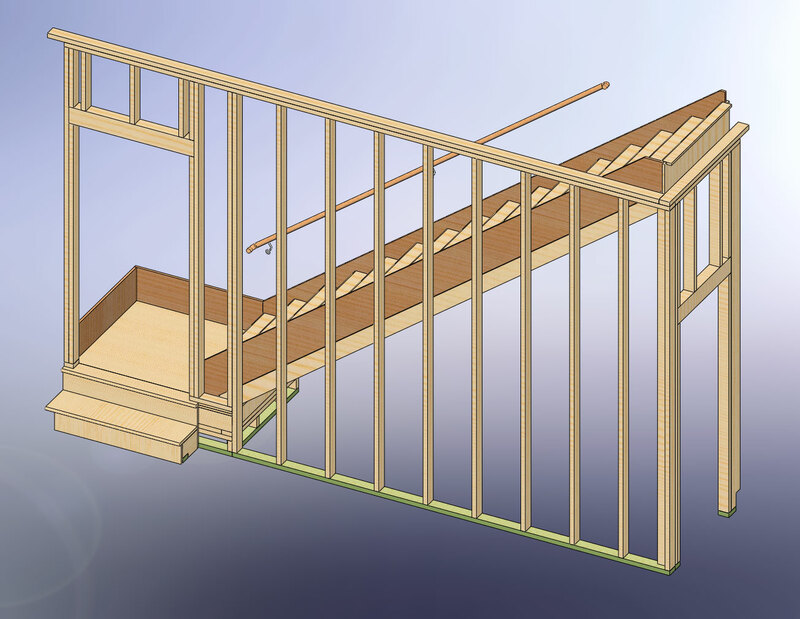 If there is a bedroom then I would need to frame a hallway/room at the base of the stairs so that egress to the exterior can be accomplished without passing through the garage. I thought I'm up on my codes but it seems like I'm always missing something, probably the reason I'm posting on this board. 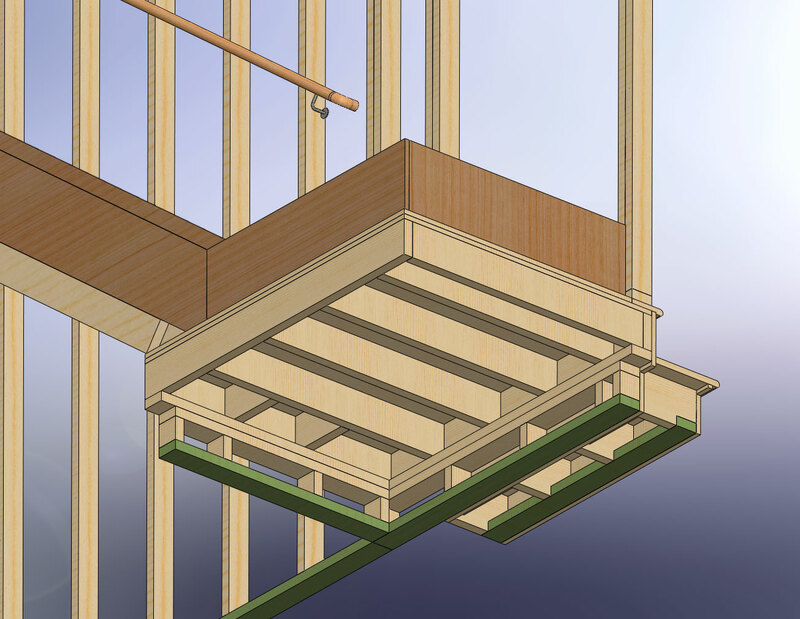 After designing the stairwell I realized as well that even if the stairwell is insulated and sheetrocked it will be cold down (cold air from the attic will tend to the lowest point) there but I would rather leave the top open then have so many doors closing the space off. However, if there is an apartment upstair and I remove the door from the landing and frame a small room at the base of the landing/stairs then it might make more sense to close it off up top. 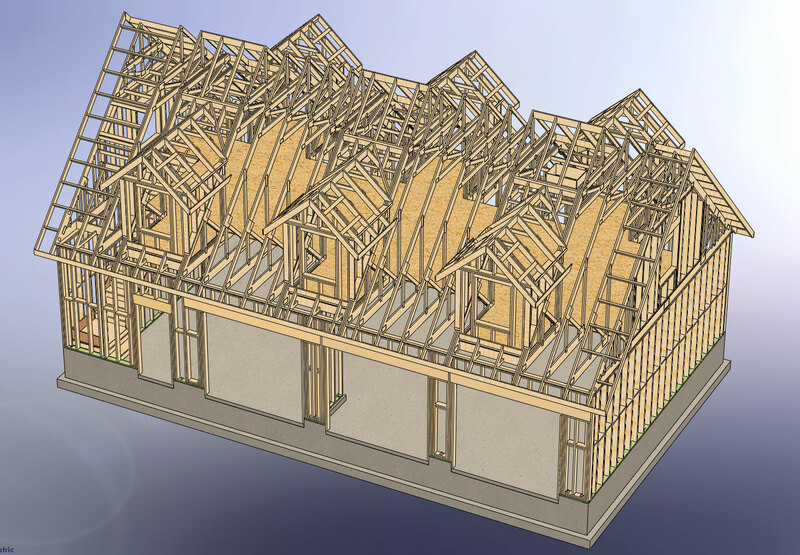 I would have actually preferred to frame the dormers as you suggested but when I raised the dormer height so that dormer top plate height was 8'1" the dormers looked too high to me. 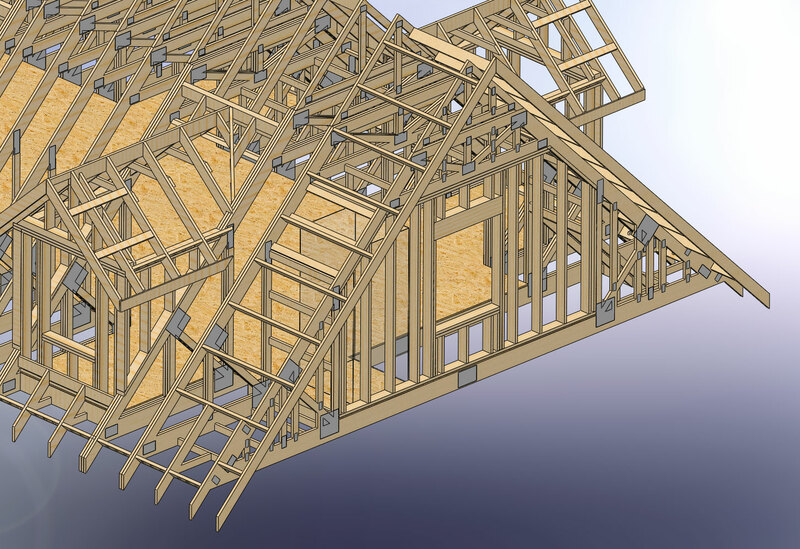 On a larger span roof (higher ridge) I would probably go this route since it simplifies the dormer roof framing. I don't prefer open soffits. When I lived in Utah pretty much everything was closed soffits, usually aluminum soffit and fascia. Here in Washington the norm seems to be open soffit with vent blocks between the trusses. Maybe it has something to do with moisture or something, western WA is wet, everything molds out here, including the new dog house I just built, its very annoying. 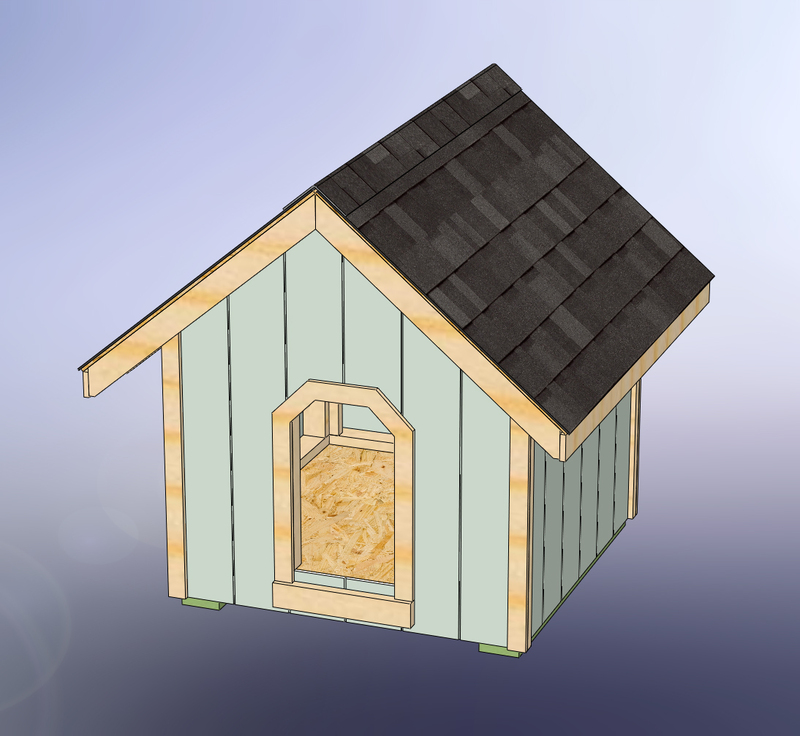 On my previous shed design I used Simpson Strongtie H2.5A to tie the dormer rafters to the dormer walls. I will probably use those same ties for the outlookers as you suggest. Wind uplift can be a factor and should be considered. 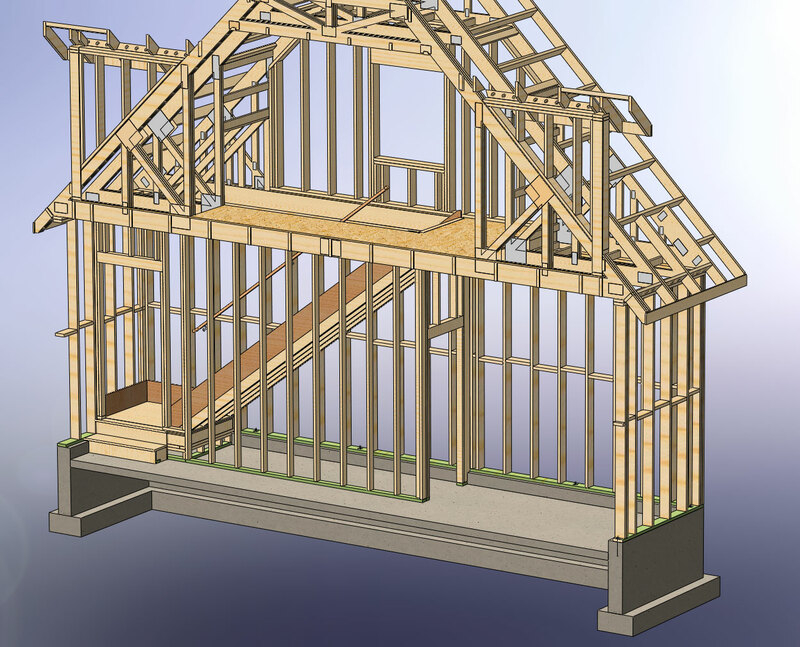 The sheathing joints on the roof appear to line up with the piggyback truss joint line, how convenient. I guess my only thought is to cut the first run of sheathing in half and then it straddles it nicely but then I have a sheathing joint near the eaves which weakens that whole interface. Not sure how to win sometimes. I added the hold-downs into the model last night, probably a bit of overkill but it should be secure. I finally got around to taking the PE exam this last October (Mechanical Engineer, Washington State). However, I've found over the years I'm much more interested in the structual engineering field and now even architecture. If I can find the right firm I'd like to work toward the requirements for an SE (structural engineer), two more years of experience and a two day 16 hour exam. 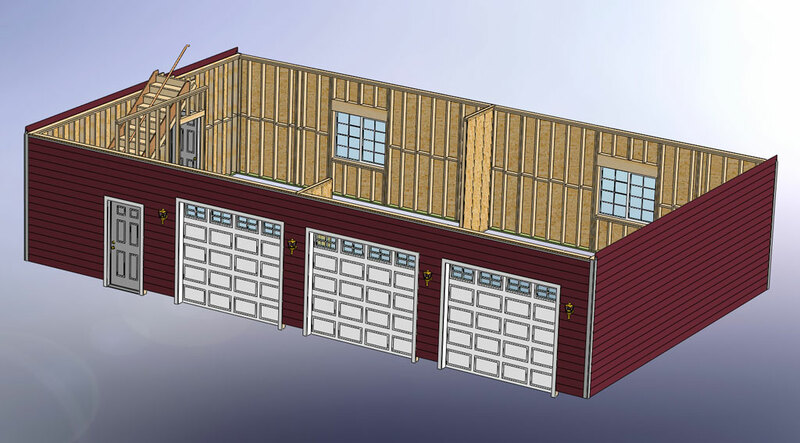 The new garage will have 10ft walls, attic, six dormers and maybe an alternate apartment up top. 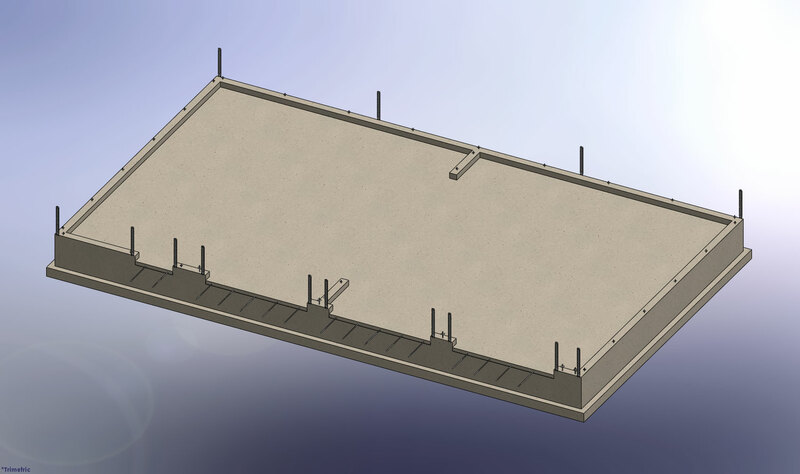 Like my previous design this one has 6 dormers but I made them just a bit taller because of the larger roof (28' span). Unlike my previous design I went with a dropped top chord on the gable ends, I think this is alot better in terms of strength and good practice. Any thoughts on what could make this design even better? Haven't posted in a while, but I'll put up some new information shortly.